I got a couple of new knitting/crocheting books and quickly whipped up a hat from one of them. This is the "Soldier" hat from Get Your Crochet On! Hip Hats & Cool Caps . I think it came out well, considering I fudged with it a lot since I couldn't get the right gauge. All of the patterns in this book are cool, but the sizing is a mystery. Some hats are one size, others come in small, medium or large, but no measurements are given and I really don't feel like I should have to do the math to figure it out. I hate math. I wore this hat today, paired with bright red lipstick and let me tell you, I was a sight. It's funny how a blazing red hat and matching lips will draw the bored gazes of fellow subway riders to you. It reminded me of that time I took the A train down to my coat check job. 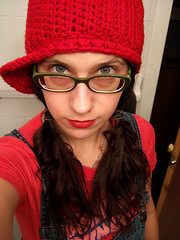 I was wearing a black crocheted newsboy hat from The Gap and vampy red lipstick. Some guy actually followed me off the train and gave me his business card. It said he was a photographer. An amateur photographer. Needless to say, I didn't call him. Now I'm making another hat from Get Your Crochet On! for Kyle. It's called "Lively Up". He wants the one with the baseball bill on it, but I want to make myself the one with the brim. 'Tis way cool. The sizing is a bit wonky on this hat too. I used a J hook to get the large size gauge, but it fits me. I'm worried it's not going to fit Kyle's enormous head, although he tried it on this morning and said it fit fine. The only truly bad thing about this hat thus far is the yarn I chose. I'm using Lamb's Pride Bulky. I always forget how much I hate this yarn until I'm knitting while simultaneously trying to cough the mohair out of my throat. Ohman....I do LOVE your new red hat. I just may have to go out and buy that book now. I love the textured look of the stitches. Nice job even if you did have to fudge it a little bit. It looks great on you! It's a super cool book with many delicious hats, but be forewarned about the sizing omissions. Nevertheless, I want to make one of each hat! I love how that turned out! I have the book and am working on the mc & the fedora style one (book not in front me right now). I can't wait to see how they turn out & you're right -- latest post he is so cute/needs his own vespa vibing cute! !